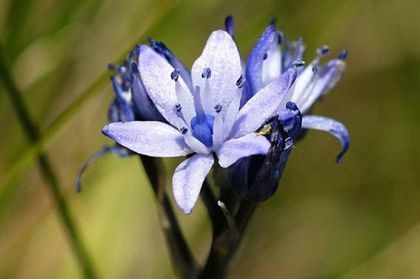 Spring Squill is not easily confused with other wild plants on this web site. Small hairless perennial bulbous plant which grows in dry, short, coastal ground. Its leaves are curly and linear with a hooded tip and appear in early spring, before the flower. The six-petalled lilac-blue (10-15mm) starlike flowers have bluish bracts in a cluster on a short upright stem and appear from April to May. It is very easy to miss this little flower as it sits only too well into the surrounding grass but is well-worth looking out for on a walk along the coasts. It mostly occurs along eastern and north-eastern coasts, and sadly is not as widespread as in Colgan's time (see panel). This is a native plant and belongs to the family Asparagaceae. I first identified this flower in 2007 near Newcastle, Co Wicklow and photographed it on Rathlin Island in 2011. 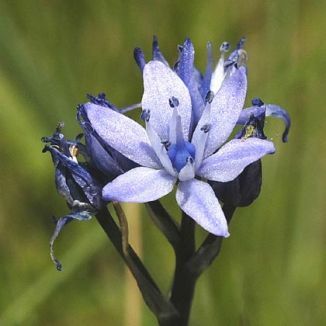 'The Vernal Squill remains to the present day a vigorous member of the Dublin flora, banished indeed from Ringsend by the march of "improvement", but clothing every spring the grassy slopes and rocky knolls of Howth Head and Ireland's Eye with its sheets of pale lavender'.